Filling of the Back Bay south of the Mill Dam began in the fall of 1857 and the first houses were constructed on the newly-made land in the early 1860s. The filling was done roughly east to west, with the area north of Commonwealth Avenue proceeding more rapidly than area south of Commonwealth Avenue. As the land was filled, the lots were sold at auction and houses were constructed. The map to the right, prepared by civil engineers Fuller and Whitney in 1881, shows the progress of the land fill by 1861. During this period, the first two churches to be located in the Back Bay were built: the Arlington Street Church and Emmanuel Church. The Arlington Street Church at 20 Arlington (northwest corner of Arlington and Boylston) was designed by architect Arthur Gilman and built in 1860-1861 for the Unitarian congregation whose meeting house previously was located on Federal Street. The cornerstone of the new church was laid on May 28, 1860, and the church was dedicated on December 11, 1861. The map below indicates when a building was first constructed on a specific lot through 1864. 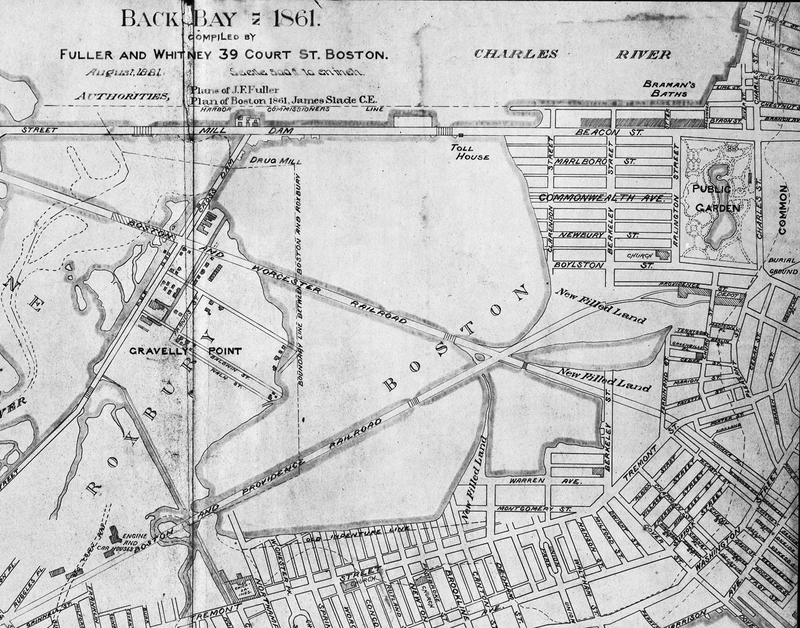 Included are lots within the residential portion of the Back Bay, as defined for purposes of this website, plus buildings on the north side of Newbury. The dates used are based on original permit applications or similar documentation, when available. When no such documentation is available, the dates provided in Bainbridge Bunting’s Houses of Boston’s Back Bay are used. Following the map is a list of the 154 buildings constructed between 1860 and 1864 in the residential portion of the Back Bay. Below is a list of the 153 buildings constructed between 1860 and 1864 in the residential portion of the Back Bay. Houses indicated as demolished were replaced by 2015.